What Are The Pros And Cons Of Amazon KDP and KDP Select? Amazon self-publishing is by far the most popular publishing service for indie authors and independent publishers. Making your books available on Amazon stores worldwide gives you the best chance to sell your ebooks to Kindle or Kindle app readers. However, there is a choice you need to make when you publish. 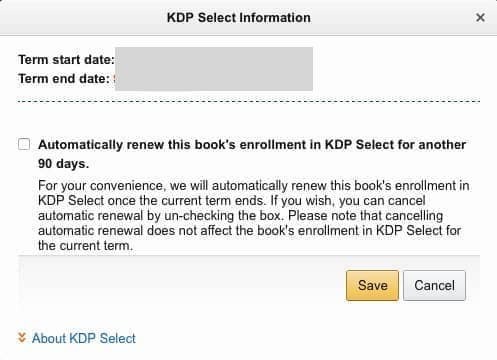 You can choose to remain in the standard “vanilla” Kindle Direct Publishing (KDP) platform or you can choose to enrol in the KDP Select program. You should consider what is best for you before deciding on either option and make sure that you are aware of the differences and benefits of each one. With Kindle Direct Publishing there is no right or wrong choice between KDP and KDP Select. It will depend on your publishing and book promotion plans. To help you decide, here is a brief summary of the pros and cons of each choice. What is the difference between KDP and Select? What are the pros and cons of Amazon KDP and Select? Verdict – Amazon KDP or Select? Amazon Kindle Direct Publishing (KDP) is non-exclusive publishing. There are no restrictions and you can sell your ebook through any other retailers, as well as with Amazon Kindle. Amazon Kindle Direct Publishing Select (KDPS) requires that you give Amazon exclusive selling rights for your ebook. You cannot offer your ebook in any file format on any other ebook retailer. It can only be offered for sale on Amazon. You will also be restricted by the amount of free sample content you can use, even on your own website. The limitation is 10%. “When you enroll a book in KDP Select, you’re committing to making the digital format of that book available exclusively through KDP while it’s enrolled in the program. All content enrolled in KDP Select must remain for sale through the Kindle Store only. If the digital version of your book appears to be available for pre-order, for sale, or for free elsewhere (such as on your website or blog, or a third party’s website), then it is not eligible for KDP Select. Adding new content (such as bonus content, author’s commentary section, etc.) to a book that is available elsewhere will not satisfy the exclusivity requirements. See the KDP Select Terms and Conditions for complete exclusivity requirements. You may also provide professional reviewers with a copy of your book via email for the purpose of editing, proofreading and helping with other quality improvements. See the KDP Select Terms and Conditions for more information. 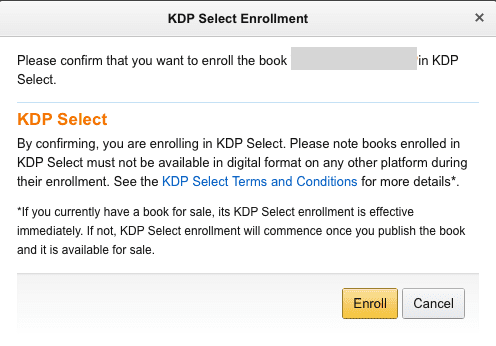 When you enroll a boxset in KDP Select, none of those books can be offered on another platform. Make sure that you select the right option for you means that you must pay close attention when self-publishing your ebook. Also, if you are already published, you should check your KDP bookshelf to make sure that you have made the right selection. The two images below are where you tell Amazon which option you prefer. If you select this option, your ebook will be enrolled in Select for a limited time period of 90 days. But be careful because it will auto-renew if you do not take one more step, as shown below. After you have enrolled in KDP Select, check your status and uncheck the auto-renew if you want your enrolment to end after 90 days. If you want it to renew, leave the tick the box checked. You can change this option at any time. To understand which Amazon publishing platform option is best for you and your Kindle book, let’s take a look at the benefits and drawbacks of these two alternatives. The main advantage of standard KDP publishing is that there are no restrictions placed on you as to where you can offer your ebook for sale. You can offer your ebook for free on your website, or you can offer extended preview reads to help with your book marketing. You can publish and sell your book with any other ebook retailers, even at a lower price, as Amazon states here that it no longer price matches. Because your ebook will be available for sale on all Amazon Kindle Stores, your ebook will be available on by far the biggest ebook retailer in the world. Amazon. This really is a huge advantage. 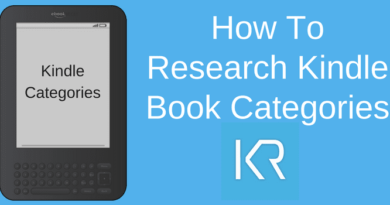 However, you can still take advantage of gaining more sales or using discounting for your book on other ebook retailers such as Apple, B&N, Kobo or any others you choose with your ebook aggregator. Your ebook will not be available on Kindle Unlimited, Amazon’s subscription reading service for Kindle owners. You cannot use promotional tools on Amazon such as Kindle Countdown or free book promotion using Kindle Free ebooks. Obviously, the inverse of KDP cons. Your ebook will be available on Kindle Unlimited, Amazon’s subscription reading service and the Kindle owners lending library. Reading royalties are calculated and paid from the Select Global Fund. Your ebook will be eligible for 70% royalty earnings on sales to customers in Brazil, Japan, India, and Mexico. You can use book promotion tools such as Kindle Countdown Deals and offer your ebook for free for a limited period of five days every three months using Kindle Free books. Exclusivity restrictions stop you from being able to offer your ebook for sale, or for free, anywhere else other than Amazon. Auto-renewal can be a trap. Check very carefully, as illustrated earlier to avoid rolling over unintentionally for another three months. If you have ebooks for sale on other retailers and wish to enrol in Select, you must ensure that all your ebooks are completely removed from other retailers before you enrol. This process can take days or weeks for some retailers. Failure to do this can result in Amazon warnings, or worse, delisting of your ebook. If you have a problem and need assistance in removing an ebook from sale, contact your aggregator or retailer. In my experience, aggregators will react and help you in working to solve the problem as quickly as possible. There is no right or wrong choice. It will depend on each service or feature that fits with your self-publishing objectives. If you wish to open-publish, which means that you can sell your ebook on as many retailers as possible, then standard KDP will be the right choice for you. But if you are content to have your books published and for sale on Amazon only, and have your ebook included in Kindle Unlimited and use the promotional services Amazon offers, then Select should be your choice. However, if you want to get the best of both worlds, you can always hop in and out of KDPS. Many authors and publishers do this to maximise book sales potential. From my own experience, I favour putting some of my ebooks into Select for the summer months, and then back to standard KDP for the rest of the year. The only important point is that you know what you are doing, and understand the pros and cons of the two choices on offer. Once you do that, then you can leverage whichever option you choose to your best advantage by using effective book promotion. The choice between enrolment in KDP or Select only affects Kindle ebooks. If you also publish your book in a print book version on Amazon using Kindle Direct Publishing or Lulu, there are no restrictions at all on these versions. There are also no restrictions on audiobooks. Further reading: Should I Enrol In Amazon Kindle KDP Select? What Are The Best Ways To Sell Books Online? Everything explained in so clear and main words!! You state that being in KDP select stops you from selling or promoting your book anywhere other than Amazon, I just want to point out that being in KDP Select does NOT stop you from promoting your book anywhere – you just can’t sell it anywhere else. Promoting and selling are two different things. Promote (aka advertise) it everywhere you can find! Hi. Thanks for the article. But going through the conditions, I didn’t see the 10% rule on digital content allowed elsewhere. I may be mistaken but can you please provide the provision which allows it. The condition is quite clear. 1 Exclusivity. When you include a Digital Book in KDP Select, you give us the exclusive right to sell and distribute your Digital Book in digital format while your book is in KDP Select. During this period of exclusivity, you cannot sell or distribute, or give anyone else the right to sell or distribute, your Digital Book (or a book that is substantially similar), in digital format in any territory where you have rights. Do you mean that that KDPS stops your ebook from being listed on all Amazon Kindle Stores? I have a question about the ASIN number versus my own ISBN number. Does the ASIN number limit me somehow in terms of offering the e-book outside of KDP (given that I don’t select to enroll with KDP Select)? Hi Jacob. The ASIN number is purely for use on Amazon. It is assigned by Amazon to Kindle ebooks. and can’t be used anywhere else. The ASIN number doesn’t change if you are in Select or not. If you want to offer your ebooks for sale on other retailers, you normally have the choice to use your own ISBN. However, most aggregators such as Smashwords or Draft2Digutal offer to assign a free ISBN. All of the articles I’ve read comparing KDP with KDP select mention the advantage of having your book qualify for Kindle Unlimited, but nobody elaborates on the extent of that advantage. How many more of our books could we expect to be downloaded on Unlimited vs. regular KDP? 10% more? Twice as many? I know it varies from book to book, but in general how much does Unlimited increase a book’s readership? With the KDP option, can the author elect to have his book printed in hardcover instead of paperback? Does Amazon only push for the paperback? If a hardcover option is available, what are the royalties then? As far as I know, there is no hardcover option as yet on KDP. I may be a bit OCD here, but if I have a novel series (each book with the same main title but different subtitles and plots) and I only enroll one book in my series in the KDP Select program, does the enrollment restriction from that one enrolled e-book apply to the rest of my series on other e-book sites? Would this be what Amazon considers similar content?